If they do stream it it should be with that controller. Definitely like to see this on a stream someday. Do you at least put on the demonic corrupted drugstore music to set the mood while you say RIP wallets? I have seen that ASCII Stick controller before, in Nintendo Power. June 1993, I think. It was in a SNES controllers article, along with the Konami Hyper Beam, a wireless controller for the Famicom and Super Famicom. I have one and at one point was sort of working (I think Start was broken) but a few years ago I tried it and it seemed to have stopped working at all, so now it’s just a collectible in my bin of random tangled game controllers and cords. Those were on a page of “Japan only” controllers. Some say that Capcom controller (which I believe got a US version known as the Soldier Pad) works pretty well despite its strange design. And Tengai Makyo Zero. I can remember when I got mine circa 2004 when it was only worth like $5 complete used. I wonder how much it has gone up since, especially used. Perhaps more since the release of the fan translation. 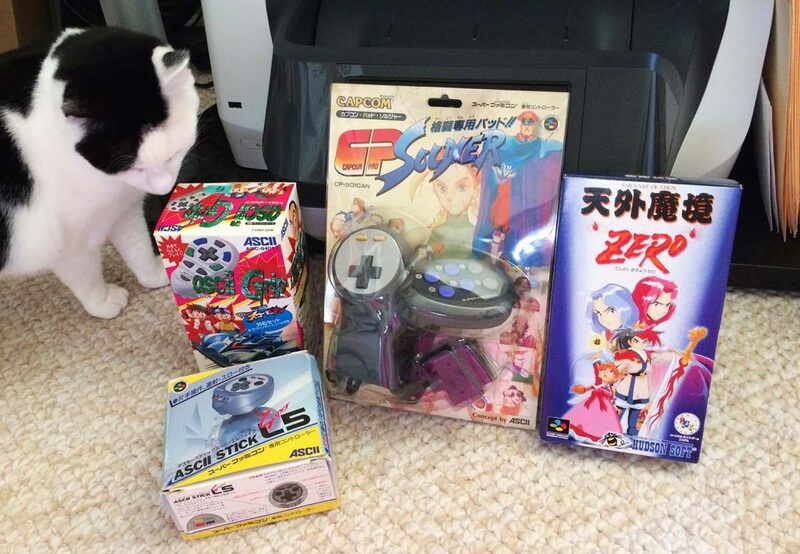 Back when Super Street Fighter II was released for the SNES I’d only use that Capcom pad to play it–and when one of my college housemates brought in a 3DO I got the 3DO version of it. It actually did make things easier.